Since the beginning of time, there has never been a musical genre unlike Bluegrass. Bluegrass music and musicians have always embraced the family environment of companionship and friendship. At times, it can be hard to follow musicians as they tend to work with so many other Bluegrass artists. It's a musical genre that you get to know each individual picker and singer. Let us introduce you to one of those exceptional pickers, a man named Matt Leadbetter. Like any talented musician, Matt grew up surrounded by music. He was introduced to music at an early age as he would travel the Bluegrass circuit with his father, dobro great Phil Leadbetter. "It was fun, 'cause I got to meet my heroes." shares Matt. "I got to go to a bunch of cool places. It was nice. It was nice to be with my Dad when he played with J.D. Crowe...he was like family. So I could be around him and all these bands. It was nice, 'cause a lot of kids didn't get to do that and go out of town to see the people that you idolized. It was just a real treat." The time spent with his father on the road, introduced Matt to various picking styles, music and most of all helped him form friendships. It's these established friendships that he would tap into years later. Seeing the musical potential in his son, Phil purchased a guitar for Matt when he was quite young. However, Matt would tend to flip the guitar up to play it like a dobro. Although Matt was inspired by his father to get into the music industry, unbelievably, he did not learn how to play music from him. "I taught myself." laughs Matt. "I would come home from school...I was always into music. So, I'd turn on a cd and I'd just played along with it. That's how I learned. Everyone laughs when I tell 'em that. He actually paid for me to have dobro lessons from this woman and I took one lesson and I really didn't need to take lessons from her. That ended that. I didn't watch no instructional videos or anything like that. I'd just go upstairs and turn on the cd player and play along." Matt landed his first gig in 2000 with Lynwood Lunsford and the Misty Valley Boys. Since then he has worked and recorded albums with Valerie Smith, Liberty Pike, Lonesome River Band and Marty Raybon. For years, Matt has had the itch to create and record his own album. "...Everything just kind of fell into place, so it was a good time to put things together." tells Matt. "I had a lot of friendships with great musicians. I've been lucky enough to have such great friendships with such good players; but with people who could really write some great songs too. That way I didn't have to depend on all standard stuff. I wanted some standard stuff for the people who don't know me, but they might recognize the song." 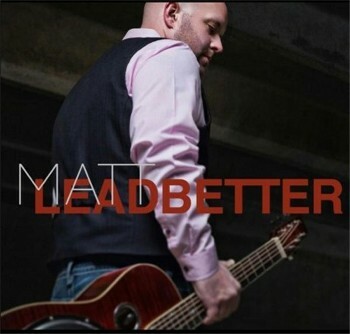 In 2015, Matt released his debut, self-entitled, solo album. The album consists of thirteen cuts that includes a beautiful version of the classic standard "In The Garden." Matt gains the help from his former boss, Marty Raybon, in their version of "Driving My Life Away." It's nice to hear a Bluegrass version of this classic Eddie Rabbit song. The picking on this is quite exceptional, however, it is over shadowed by Marty's limited vocals. Matt and friends showcase their vast picking styles in five incredible instrumentals that are mixed among the other songs on this charming album. These instrumentals include Jerry Douglas' "Fluxolgy," Buck White's "Sassy Fras," Robert Johnson's "Cross Road Blues," "Fireball" written by Josh Graves and their version of the traditional song "Lonesome Road Blues." Matt gains the help from Summer McMahan as lends her voice as lead vocals in "Lonely Ring." Performed with a light, heartfelt melody that tells the story of the aftermath of a breakup. Matt changes it up a bit by adding two songs performed in a country mentality with "But Not Like That" and "Tea Parties." Written by Roger Helton, "Tea Parties," is an elegant country song that captures the relationship between a father and his daughter. The lyrics ride a gentle wave of country music. But it's the fiddle that brings a sense of nostalgia and wistfulness to this angelic, light hearted ballad. This is one song that will be added to our list of wedding songs as a father - daughter dance song. Over the years, we have butted heads with Bluegrass duo - The Roys. We often find that they are decent songwriters, but lack the vocal capability and effectiveness to bring their songs to life. Recently, Matt worked with The Roys and developed a working relationship with them. As he started gathering material for this album, he received four songs from Lee Roy and chose two to add to this project. It's his versions of these songs that give us proof of what we have been saying for years - that The Roys are good songwriters, but it takes some else to bring their music to life. Throughout the album, Matt lends his vocals as back-up to that of his talented friends. Written by Lee Roy, Matt showcases his unique, down home, vocals in "Down On Your Knees." Many listeners will find divine inspiration in this gentle, two-step ballad. Nonetheless it's Matt's down home, folksy, genuine vocals that brings this song to life. The second song is written by Lee Roy and Keesy Timmer called "A Love Like That." This song has been added to our list of Songs for Soldiers as it tells the story of a man who asks the love of his life, to wait for him, through war. This is one song that tells the story of many, many people with it's original and honest tale that rides a roller coaster of emotions. This song will be added to our list of Top Songs of 2016, while earning a nomination for the Spirit Award's Song of The Year. Perhaps the best song on this album is another song that will be added to that list and is also the opening song. "Down On River Road," is a haunting song that tells the story of a murder. Its the instrumentals that bring a sense of nostalgia as it has a slight feel of the gangster era within it. One can view the story in your mind's eye as you listen to the lyrics. Is there a difference between Matt and his father? There certainly is. Phil maintains the deep seeded roots of what Bluegrass was born with. Where as Matt takes that mentality while adding his own style of respect for the music, the musicians and the listeners.